Okay, so I added 'snow cover' to this board's subtitle, just so I would have somewhere to put this. Al Rodger wrote a great guest piece last summer for the ASIB explaining why snow cover is important, and how its summer decline is at least as important as that of Arctic sea ice. Graphs comes from Rutgers University Global Snow Lab. 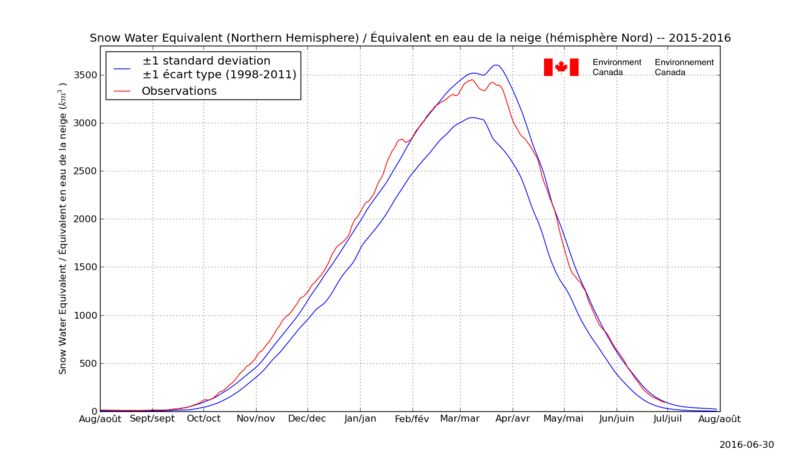 It will be interesting to see if we will have a new snow cover anomaly record at June/2013. The last five years were of impresive anomalies and of course, it has a relation with the permafrost and methane emissions, even that I would say that there is not good measurement of methane emssions related to the thawing of the permafrost. I've been using the same chart to paint a picture of what will happen if this trend continues. The June anomaly doesn't have to increase, it's magnitude is already at three times the area of Greenland or the remaining arctic sea ice at minimum. I picture a large NH area having air masses warmed by the albedo change during the most direct times of sunlight. I think those Greenland melts are going to become much more usual and hope it will motivate governments to show their proper concern about climate change. Afterall, Rip Van Winkle only slept for 20 years. Eurasian snow retreat in May is leading to warming and this early start to the melt season is occurring over major areas of permafrost. That latter point is missing from my blog post, but I thought my readers would be all too aware. I am sure that is true but at the moment graph says it runs to 2012. I guess that is one way to appear to be first to post on release of graph. Or did graph update and then revert? I just looked at the bars and it looked to me like the 2013 bar was there. At the top it says 1967-2013 as well. We're talking about the March bar graph, right? This is what I see above and when I go to site and control-F5. Says 1967-2012 March at top and last bar is negative. Control-F5 should clear any cache and download it again shouldn't it? Am I looking in wrong place? I'm confused. Edit: sorry ignore me. Control-F5 didn't make a difference but tried a simple reload of the page and it worked. Shows above too now. Snow cover over sea ice is an important, under-reported measure during the dark cold Arctic Winter. Snow is an excellent thermal insulator. When snow covered, sea ice attains thermodynamic equilibrium with the atmosphere when it is much thinner than bare sea ice. Alternatively, snow-covered sea ice will grow to the same thickness only if the atmosphere is much colder. We know from the 80N temperature plot this Winter that the atmosphere WAS not much colder, in fact it was warmer than normal except for the period spanning Feb/Mar with high winds, which tends to scour the surface of warm air by mixing in higher colder layers. Additionally, the Feb/Mar break-up event itself argues that the sea was not as strong as in past years, which may indicate that it's thickness was reduced. Two important results will come out in May. First will be the report from NASA Icebridge, which flew at least two missions over the Beaufort sea in late March. Second is the scheduled public release of AMSR2 Level-2 data, which includes 'Snow-over-sea-ice' data. Looking forward to this analysis since I think it will be quite useful for prediction as the 2013 melt season progresses. ...the period spanning Feb/Mar with high winds, which tends to scour the surface of warm air by mixing in higher colder layers. Sterk, H. A. M., G. J. Steeneveld, and A. A. M. Holtslag. "The role of snow‐surface coupling, radiation, and turbulent mixing in modeling a stable boundary layer over Arctic sea ice." Journal of Geophysical Research: Atmospheres (2013). There is also a freely-available PDF for interested readers. Results indicate a shift in process significance for different wind regimes. For low wind regimes, the model sensitivity is larger for surface coupling and radiation, while for high wind speeds, the largest sensitivity is found for the turbulent mixing process. An interesting non-linear feature was found for turbulent mixing for frequently occurring wind speeds and low wind speed cases, where the 2 m temperature increases for decreased amounts of mixing. So it seemly likely that decreased 80N surface temps during Feb/Mar 2013 were the result of enhanced wind-mixing of the surface layer with colder higher air. The Siberian snow drought is apparent in the Rutgers and Drought Monitor imagery. Attached are the Rutgers Snow and Departure from norm for May 25 2013, and the Drought Monitor for Siberia as of May 16, 2013. Very warm air continues to flow north over Siberia for the next 5 days. See chart. (Note: This only includes land snow, not snow on sea ice, so this is a separate measurement from the very low June snow seen on sea ice this year). Nightvid & Vergent get a mention! I could n't see a more recent thread, although I am sure NH snow cover crops up regularly in other threads so I've resurrected this one. Kind of surprising there is n't more about this topic. 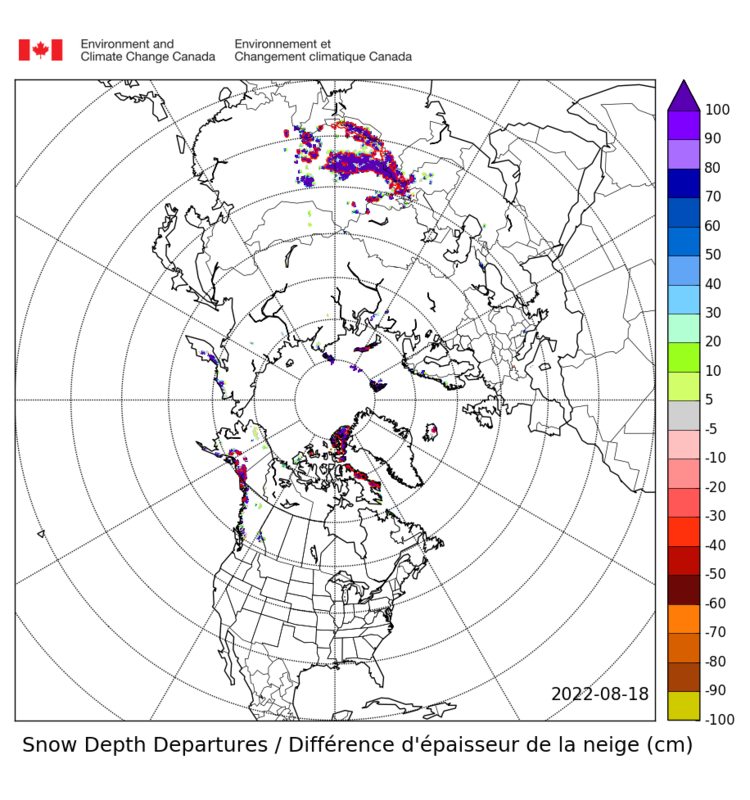 As the NSIDC put it "in terms of area, snow cover is the largest single component of the cryosphere, covering an average of about 46 million square kilometers (about 17.8 million square miles) of Earth's surface each year ." Interesting to look back on some of the posts from the start of this thread or indeed prior to that in this blog five years ago from Neven. In recent years the lack of snow cover was especially evident in the crucial late spring/early summer period. "At the height of this summer's melt, 2012 was 8.5 million sq kilometres ahead of the 1972-1979 average. This is a full month advance in the melt over a 27 year period." So here is an update from Rutgers University. 2017 is turning out to be a snowy year. I've put it alongside 2016 for comparison. 2016 was much like the years prior showing serious decline in snow cover. 2017 has seen quite a turnaround. Most months so far with positive anomalies and the negative ones were only slight. The question is, are we seeing a shift in the climate of the Arctic, a change from a once desert climate to a more snowy one. Will the warming world lead to more snow in the Arctic ? Or is this recent change only a blip ? I know you have a particular interest in this topic (I find it interesting myself as increased precipitation is an expected response of climate change.) Posting here is the right thing to do and, if you continue to use this thread, it will remain active and draw more visitors. Question....hasn't there been a trend of increased earlier NH snowfall over the past decade? I remember someone posting this but cannot remember where. All the months from September through to January show a positive trend for monthly northern hemisphere snow cover (1967-2016). You can check out the plots here for each month. For the other months there is a negative trend. This year continues to see mostly positive anomalies. For October 2017 the NH snowcover was 21.17 million sq km. (+3.63 above the 1981-2010 norm). A little bit less than October 2016. This being the first month that 2016 had higher anomaly than 2017. NH Snow cover extent for November 2017 continues in same vein to the previous 8 years, with another positive anomaly. +2.01 million km2. A little bit less than last year's high value. It's third lowest according to NOAA's Automated Multisensor Snow/Ice Mapping System. Yes, that NOAA chart shows a bit of a dip in extent for December. , when the December figures roll out I expect Dec 2017 will be lower than last year, especially given the conditions over North America this month. I would be surprised if the NOAA graph is any much different to the Rutger's graph. When we look at sea ice extent graphs we look back to the start of the satellite era circa 1979. Why should we do any different for snow cover ? I agree and didn't mean to contradict you. Your post just prodded me to have a look at the Multisensor graph. It may not be as 'mild' as last year, but there has also been less snow so far (not so many storms coming in from the Atlantic). Agree that for Eurasia it has not been as snowy this December. I saw a report that Moscow had no lying snow recently and they rang in the new year under rainy/grey skies. Here is an interesting report from Dartmouth College : Warming seas double snowfall around North America's tallest peaks. I wonder when/if this would transfer into glacier growth ? Extract: "We were shocked when we first saw how much snowfall has increased," said Erich Osterberg, an assistant professor of earth sciences at Dartmouth College and principal investigator for the research. "We had to check and double-check our results to make sure of the findings. Dramatic increases in temperature and air pollution in modern times have been well established in science, but now we're also seeing dramatic increases in regional precipitation with climate change." According to the research, wintertime snowfall has increased 117 percent since the mid-19th century in southcentral Alaska in the United States. Summer snows also showed a significant increase of 49 percent in the short period ranging less than two hundred years. We tried to do our part: a few flakes of snow fell this morning here in Tallahassee! Here in French Southern Alps we had quite a lot of snow in December 2017, whereas December 2015 and 2016 had been completely dry. But it comes with brutal temperature changes. On December 10th we had about 50cm (at elevation 1000m) starting to fall in the morning at an amazing low temperature (around -10°C), and the day after it rained all day on this deep and cold snow, turning it into a nightmare of ice. And today we had wind and rain up to more than 2000m at the southern edge of Eleanor, the strongest (so far this winter) of a series of winter storms. This kind of weather had become frequent. Instead of a good quiet snow fall followed by stable and cold weather for weeks, snow comes in the form of storms and with rapidly changing temperatures. Globally, more snow might fall, but it's not here to stay all winter long as it were. Most ski resorts in France use artificial snow to ensure all-winter opening (at a silly cost in water and energy). The impact on glacier might be more accumulation at high altitude. But it does not prevent the ablation zone to climb higher and higher in summer, and the global yearly budget to keep steadily negative. BTW I should certainly open a new thread about it, but my wish for 2018 for this forum would be to see it enforce the use of the International System of Units, as any respectable scientific forum should, and stop using units from the pre-scientific era such as square miles, feet, gallons and unameit. Current warming won't allow glacier growth any time soon, maybe in ~50000 thousand years or so, according to the Astronomical CLimate Index. Red is past/thousand yrs, blue is future/thousand yrs. Bottom curve is sea level. NH Snow cover figure for Dec 2017 was 43.57 million sq km. This is a little below the 1981-2010 average. Much of the deficit was in Eurasia. Anomaly of -0.41 million sq km. This completes the anomaly chart for 2017. Last year I've seen people say that the high snow-cover (more snow leads to more evaporation leads to more clouds during summer leads to lower temperatures during summer) could be a possible explanation for the lower melt during summer. And also for the lower ice-growth during freezing season? Though it's a little too early to say anything about how the snow cover will be in the coming months, could this lead to a better freezing season and a worse melt season? This is above the 1981-2010 average by just a small margin (+0.065). It is approx 2 million km2 less than 2017 and 2016 figures. Note also that extent is sort of average, while snow water equivalent is really high. Heavier wet snow which would become more common as temps rise? ...or if other locations are like mine (SE WI, USA), cold rainfall into an existing snowpack can really ramp of SWE even as the depth of that snowpack slowly decreases, and winter rains also become more common as temps rise. It is being driven by Quebec, NE Siberia, Scandinavia, and the Himalayas. The anomaly in most of these regions is now worsening year over year as they become snowier and snowier, especially Quebec. I suspect the large accumulations of heat in the NW NATL, NW PAC, and the Arctic in general are to blame. The Himalayas have been purple ever since I started watching these graphs and put them on the ASIG. I don't know if this skews that snow water equivalent graph. If there is so much extra snowfall there - which doesn't melt out in summer, still purple - we'd hear about it, right? But anyway, we've been over this before. 1. This happens every year with area near Arctic mainly green with blue in patches. 2. Is it really warm enough for wet snow? Different hypothesis has been mentioned many time before, warmer air carried more moisture and so more precipitation and it is cold enough to fall as snow or ice pellets. Occam's razor: if we don't need wet snow to explain it and wet snow seems unlikely then perhaps we should stick to explanation without wet snow. Just thicker snow as is typical post 1990ish. Further south we get red areas because it is warmer. Melt / precipitation can fall as rain comes into play further South but not near Arctic. Is there reason to think we need extra explaining factors? This graphic shows snow depth anomalies rather than SWE anomalies. SWE can be the same between a 50cm snowpack and a 20cm snowpack. That snow water equivalent. Is that the amount of snow on the arctic ? Because a few days ago there was a post that snow was only until the ankle. Or maybe that was just a local place. I still have to learn the names of many of these places. But your post tells the opposite. This is how they say they do it. Maybe not accurate, but is there anything better around? If there is no change in conditions, then it should be outside 1SD band ~32% of time and outside 2SD band 5% of time. 1. 1998-2011 is a short base period, perhaps it didn't capture all the variability. 3. Freak conditions producing large SD deviation for long time. 4. Conditions are changing i.e. changes are suggestive of GW producing more precipitation. 5. Something broken for last 18 ish months producing anomalous values. Could well be some combination of these (and/or other explanations). Don't think I would want to claim to be very sure as to which are more likely explanations, but I wouldn't be inclined to rush to judge that it is 4 or 5. #2 + #4 = Younger Dryas equivalent happening before our eyes, the change since 2015 is on the order of +15-20% SWE at the moment (for same time of yr). That is enormous! We still have two to four weeks to go before we hit the time of max from last winter as well. Perhaps a 4 handle is obtainable? It's just too bad that the only region suffering from more cold/ more winter conditions is the region that is one of the largest polluters and deniers. Like the earth just wants to make sure we as humanity won't be able to act soon enough. bbr, this argument seems to be popping up every couple of days, so for the sake of lurkers and newbies I just want to counter that the Younger Dryas is not coming back, there is no continental ice sheet covering the whole of Canada ready to pour its meltwater suddenly into the ocean. And with any precipitation pattern you care to imagine, snow can't last through a summer where temps hit 25C. It's best to continue these arguments in the "negative anomalies of increased snowfall" thread, where it was addressed quite a lot already. You are wrong. There is a continental ice sheet over Canada at this very moment and it will indeed pour its contents into the ocean over the next few months. Instead of telling me to post in a different thread (i.e. engaging in ad hominem attacks) maybe you could rebut with facts? Looping ^ clearly shows the situation in Canada and if you think the formation of an ice sheet would look at different than our current state of affairs (can't form an ice sheet without deepening snowpack over a huge geographical area... which is what is happening...) I think you are misinformed. Guess I am going to have to set someone on ignore. I'm with James Lovelock who reckoned that all these positive feedbacks would be overwhelmed by global heating.. Mind you, he did seem to miss the fundamental importance of the oceans.